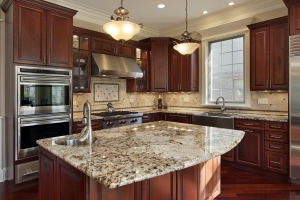 Granite island and cherry wood kitchen cabinets.. If you’re lucky to be working with a large kitchen space then have the extra benefit of plenty of light using dark wood RTA kitchen cabinets to achieve your luxury kitchen will be easy. Forevermark RTA kitchen cabinets come in a variety of styles and finishes and if you have a smaller kitchen you may tempted to stick with light wood or white kitchen cabinets. You don’t have to! 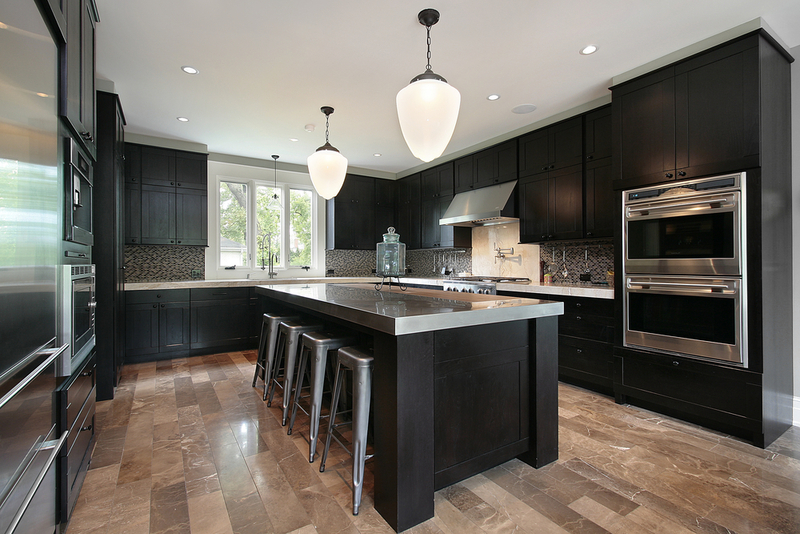 We offer up some tips below for dark wood lovers with both small and large kitchen areas. 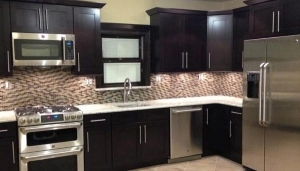 Dark wood RTA kitchen cabinets like Forevermark Pacifica RTA Cabinets, is just one option that can get you on your way to obtaining that luxurious kitchen you’ve been wanting. Even if your kitchen space is limited or you have a kitchen with low light, you don’t automatically have to install white or light wood RTA cabinets. If you want an elegant kitchen using the traditional darker tones, put your mad design and creative skills to work. With a little effort, you can have the kitchen of your dreams. Pay attention to counter tops, walls, ceilings, lighting, back-splashes and flooring. Colors and textures and geometrical shapes can trick the eye into enlarging small spaces. Dark base cabinets with white, lighter or long strip flooring or combining darker cabinetry helps to brighten up a dark space. 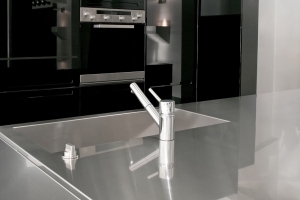 Lighter or white upper cabinets or reflective counter tops can have a dramatic effect on a smaller kitchen. Opting for dark wood RTA kitchen cabinets for any size kitchen remodel really boils down to how well you incorporate other design features. For example, both small and large kitchen spaces using RTA Pepper Shaker cabinets coupled with the perfect back splash, counter-tops and appliances can result in a very classy, luxurious and modern look, even in a small space. modern kitchen your cabinet color should not be limited due to your space. 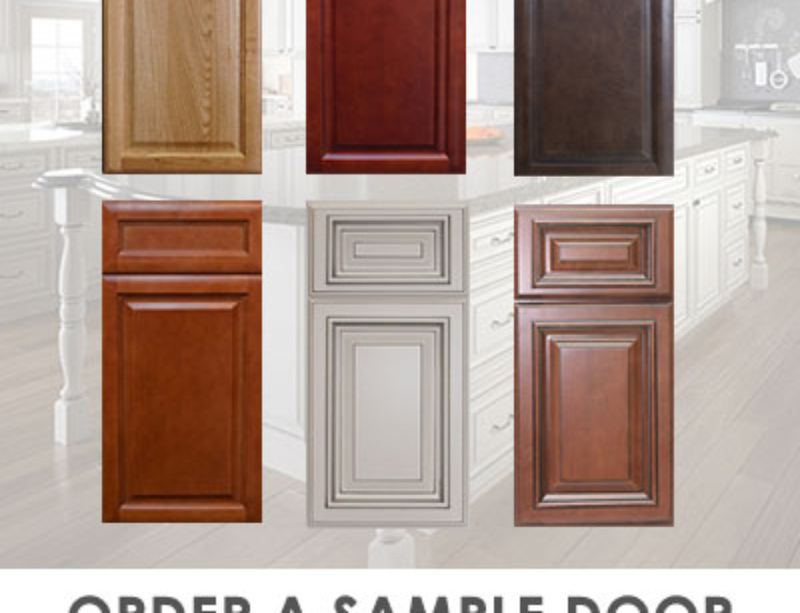 So, if you have an affinity for darker wood tones, consider Forevermark’s RTA Cherry Glaze Kitchen Cabinets or our Signature Brownstone Cabinets. With a little bit of planning and imagination, your kitchen can be turned into a luxurious space no matter how small. 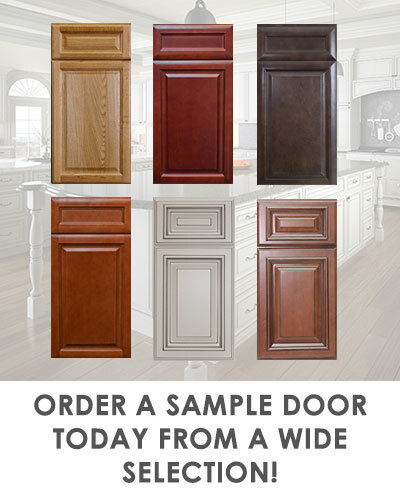 Check out these options of dark wood kitchen cabinets by Forevermark and then put your imagination to work for you! If you have questions about any of our ready to assemble dark wood kitchen cabinets be sure to reach out to Captain Cabinets for help!